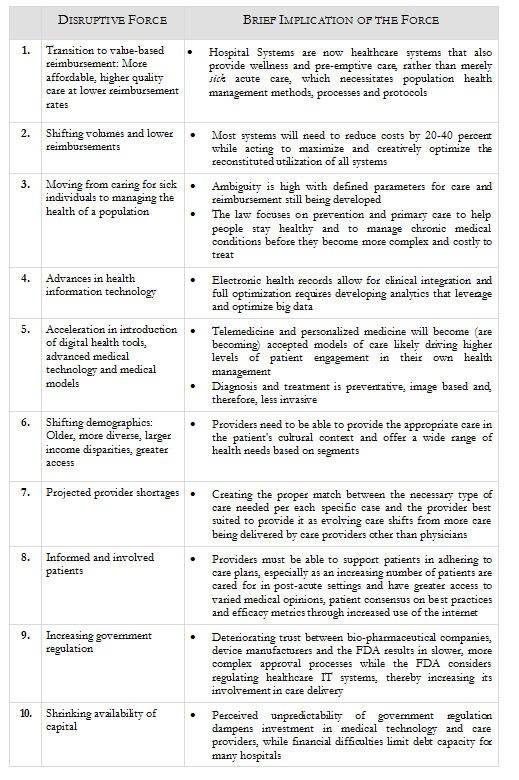 A list of the 10 most disruptive forces in healthcare was released last week by Insigniam, an international management consulting firm. Based upon a literature review and interviews with experts across the healthcare industry, the disruptive forces include projected provider shortages, the transition to value-based care, and challenges accessing capital. While community health center leaders know most of these forces all too well, the list serves as a helpful recap of the state of primary care, and can be particularly useful for health center boards as they complete the Environmental Scan phase of their strategic planning process. Access the original article or review Becker Hospital Review’s chart for a brief summary. Below is a list of resources available on Capital Link’s website designed to help community health centers prepare for these trends. View a recording of our Strategic Capital Planning webinar. Read the CapitalInk newsletter article, Transitioning to ACO and Global Payments. Consider a Market Assessment to assess your service area’s changing demographics and estimate workforce needs. Review our Operations and Facility Planning Services which can help your health center evaluate its model of care.